Did you come here expecting to find a website for a tent manufacturer? Well, we closed that operation some years ago, and Dragonwing has been reformulated as a publishing house rather than a tent-making operation. I'm still the sole proprietor, but we're now focusing on publishing books on various topics. As you may have noticed, we've also changed to a new server, with our own domain name of dragonwing.biz. If you've bookmarked our old site, you might want to delete the old bookmark and replace it with one for this new page. I don't know how long the old URL will still be active, so it's best to make sure that you've got the latest one. This goes not only for our home page but for any page you may have bookmarked over the years. To accommodate the new server's requirements and our own reorganization as a publisher, we'll be moving stuff around on our web site, but most of the information you've looked for in the past will still be there, and there will be index pages that will steer you to where you want to go. Please bear with us as we go through this transition period, and let us know if you end up with dead ends or defunct links, so we can correct them. Quantity orders are also available dirctly from the publisher. Contact us here. The print version of The Pavilion Book has returned to Amazon, this time in a print-on-demand format at the same price as before. Information can be found here. the book is also available as an ebook from amazon; you can find it here. and the price of the eBook has been reduced to $10.00 to put in in line with other electronic publications. 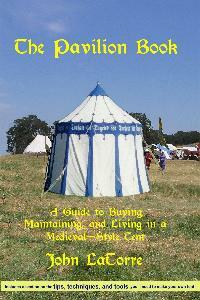 More information on The Pavilion Book can be found by clicking here. 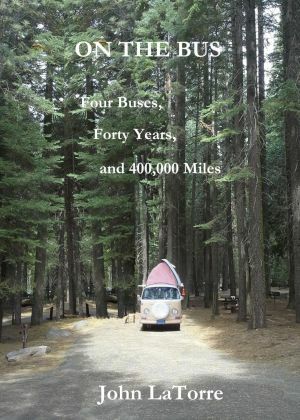 If you're a devotee of the Volkswagen bus, particularly in its camper form, you might have been wishing for a book that explains to your friends and family (and maybe even yourself) what the fascination is for these old, oddly shaped vehicles, and why they continue to find eager buyers and users. This just might be that book. It's available in both paperback and e-book form. More information can be found by clicking this link. If you're looking for the "how-to" articles on tentmaking that have been available on this site for the past twenty years, you will be happy to know that most of them are still there. It's been a real resource for many people, and I wouldn't want to deprive those who continue to rely on it. What's new will be information on some of the other writing I've been doing, and the books that will be coming out. If some of the links in the articles are no longer valid, let us know and we'll make the necessary corrections. Our latest column describes how to set up a sunshade for drying, in a much smaller area than would usually be required. for nearly every tent and sunshade Dragonwing has made since 1987, available for free downloading. You'll also find owner's manuals for the firepit and firepit bags we've sold over the years. Other people who like to talk about and make tents, plus other sites you might want to check out. How to phone, write, or e-mail us. Tell us about what you like, or what you think needs improving, about our tents and our Web site. Copyright 1997, 1998, 1999, 2000, 2001, 2002, 2003, 2004, 2005, 2006, 2007, 2008, 2009, 2010, 2011, 2012, 2013, 2014, 2015, 2016, 2017,2018 by John LaTorre on all contents except where another writer has been credited, or for historical images reproduced for the site.